well matt said,... " OK, got the synth apart and got the board out. Based on inspection with an ohmmeter only, I have a little concern that 9V may have been applied to the CPU/DSP. This is pretty much fatal to them. If you look at the schematics pg 5 there is a MOSFET (F1) - right above the S-8520F33 regulator chip [that got so hot it desoldered.] This F1 acts as a switch, where the gate (G) controls current between the source (S) and drain (D.) This appears to be still intact, I measure a short circuit between the source and drain because there is nothing connected to the gate. The source is connected to 9V. The S-8520F33 regulator is supposed to shut this FET off when the output voltage gets slightly above 3.3V, and turn it back on when it gets slightly below 3.3V. Without the regulator chip to turn it off, it tends to stay on, which would cause the output to go to 9V. I'll take it to work on Monday and try to connect an external 3.3V supply and 5V supply to the two power rails, and see if it powers up " ...more news soon. we find out today all!..stay tuned if the microkorg comes back to life! Gear: ARP Pro DGX, Avatar, EX 800, RS101, VK-8M, Juno 60, 200a, Fast 5, and Rhodes MK1 stage 73.
soldering gun delay.ordered a new one. should come in today. he is building the regulator kit first, and desoldering the two components. Then he will see if a 5 v supply works. wish him luck! The External 3.3 v regulator and bypassing the fuse ...its alive! It does put sound out!!!!!! Need to find replacement fuse and a 3.3 volt regulator small enough to fit. he can't test the digitizer - he is still afraid that something isn't quite 100% on the SuperH CPU chip. Needs to run all the self tests first. not sure how to ID the fuse, needs to do more research - the only marking is '20'. don't want to bypass it - he thinks that was what saved it to begin with. Voltage regulator - he can't use the little one that he rigged - not efficient. will probably get a TI/National evaluation board and rig it in there. So it'll still be some time for to figure out the fuse and make the order, and solder it together. still more work..keeping fingers crossed. "the bigger issue is securely connecting to the main board and mounting the new small converter unit". I got my replacement from RS electronics, but since then I have seen them in some regular electronics shops. They're cheap, but I had to buy a pack of ten from RS and then pay shipping. It may be worth asking if your local shop has one. You might not need to order it. Anyway I hope you get it working perfectly again. my friend matt is working on it in texas. he is keeping me updated. i will ask him. he says he has all the parts ordered that he needs for the fix so it should be soon. thanks. "I'm going to have to glue gun the new regulator to the PCB. It is probably safer than electronic epoxy because it is removable. I need to keep the wires as short as possible, and this is the best way to do it. So there is always the risk of it getting disconnected. I will try to document what I did so if something deattaches, it can be easily resoldered. The mechanical stuff is what scares me the most." My fried microkorg lives again! So if you use a wrong power supply....remember this..
We can rebuild him..we have the technology! microkorg is that man!...lol thanks matt! "Ain't pretty, not necessarily mechanically solid, but it works! "..i think it looks bad a*s! 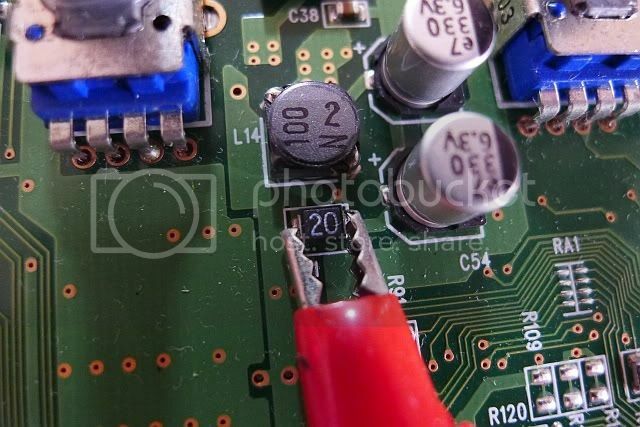 So now there is some good info here if you ever fry your motherboard on a microkorg! now whatch everyone buy dead microkorgs! cool. good to know others are getting them serviced! anyway, can i change MicroKorg's polarity to "standard" center-positive? Centre positive isn't standard for 9V power supplies, most are the centre-negative type that Boss uses. the dead microkorg is now fully 100% working! thanks to matt and ARM! now i am doing a mod on the body with new paint and name. pics coming soon! hint: we can rebuild him, we have the technology!